So long ago… – …STILL CRAZY AFTER ALL THESE YEARS! This is called tumpik lemantak which, I believe, is in Sarawak Malay. 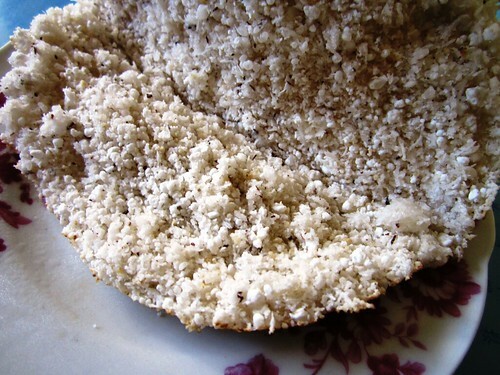 In my family, we called it tupek but it seems that it is called differently among the Melanaus in the lower reaches of the Rejang River…and lemantak is actually what we call sago flour. The language varies from town to town and the version we speak in the kampung (village) here in Sibu is actually closer to the local Malay dialect. …as she had not eaten it for an equally long time and would probably appreciate the opportunity to eat it again. I tried a bit and thought it was not too bad – not as bad as I remembered it to be. It was very fragrant with the toasted coconut and tasted pretty good when dipped in the gula apong, our local version of the gula melaka. Selling at RM3.00 a piece, however, my mum said that it was very expensive as it was nothing more than sago flour with grated coconut and added that in the past, the people in the kampung (village) who were too poor and could not afford to buy rice would eat that instead. Good grief! How things have changed! Today, just a piece of that costs more than a plate of rice. Now, if you are interested, you can drop by this site to see the photographs of a man at a stall in Bintangor making it. The sago flour gives it the gooey, sticky texture, something like mochi or one of those sticky cakes, that holds the coconut together. Unfortunately, they did not get to try the tumpik lemantak when they were in town nor did they get to eat the linut. Well, if they’re keen, they will just have to come to Sibu again. Hehehehehehe!!!! linut is nice.. had that with sambal belacan and blanched bandong leaves… see this for papua’s version of linut http://en.wikipedia.org/wiki/Papeda_(food) . You have? I wonder where you got yours from. the taste should be very nice… coz i like to eat sago..
well i believe everything is getting expensive ..
it cost about RM6 .. i told her that you can eat a chicken rice with that..
and last time it is those poor man meals…. sigh now is totally change .. I would love to try that tumpik and I think if celup sambal tumis pun sedap jugak.The only weird thing which isn’t weird at all while I was in Sibu is the fermented dabai.The small biji-bijis thingy that you let me try was tebaloi, right? I like that… no taste but very fragrant. No, those were sagu’ (saguk) – toasted sago pellets – a favourite among many but I’m not a fan. 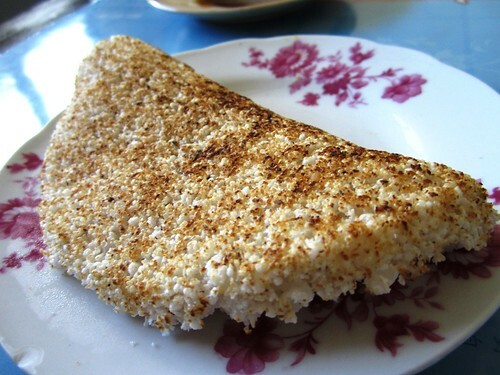 Terbaloi is flat sago-coconut crackers, also very fragrant and nice. Ya, no worries. You’ve a sweet boy there – he’ll grow up to be a fine young man, I’m sure. 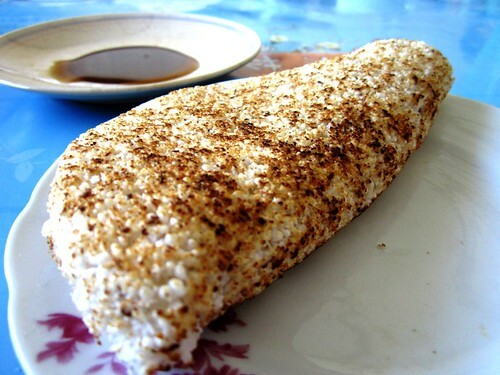 Yes, I have eaten tumpik lemantak when I went to Mukah last time. Not a fan cos I find it too dry. Wow, RM3.00 per piece, so expensive and like what your mum say it is only make of sago flour and grated coconut. Lastly, wishing all mums and mums-to-be a very Happy Mother’s Day. The same to you. Never mind, just bought it so my mum could eat it again. Don’t think I’ll be going back there to buy it again…unless there are visitors coming to Sibu who would like to give it a try. 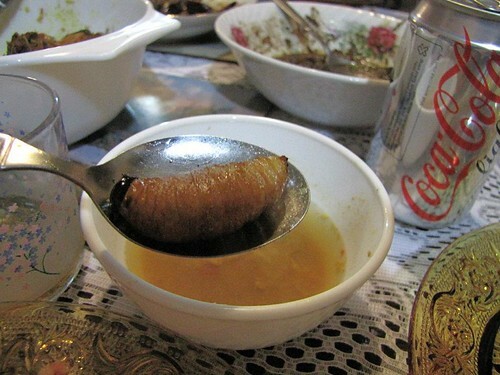 It’s been 4 years & I’ve yet to try the sago worm. I keep talking about it but never actually got around to doing it. When I wanted to, they never seem to have any in stock at the market. I’m not sure if I can eat that! hehe! happy mother’s day to your wife! Come on over… Many things here that you haven’t seen or heard of. Eeeeeeeeeeee…both look “geli” to me. 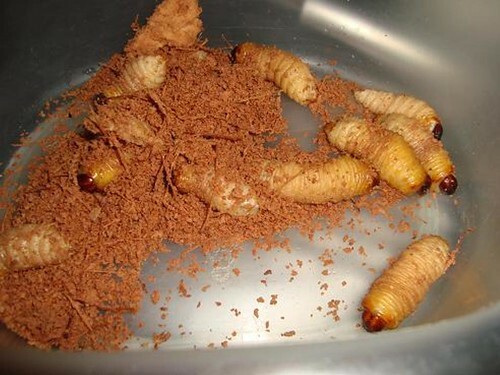 No way I am going to eat the worms. Kill me better. LOL! Pingback: A brand new day… | ...Still crazy after all these years! Pingback: Africa… | ...Still crazy after all these years!